Thanks for covering such a famous Michigan unsolved murders case. I used to work with a sibling of one of the Oakland County Child Killer’s victims and he had interesting theories on who did it and why the case has remained unsolved. On a technical side note, your voice is predominantly coming out of the left channel on this episode. It’s usually mixed in the center. I used a different audio set up to record and I noticed the shift. Going to change some things around for next week see if that fixes it. Hi, Nina, I hope at this point that my comment will be seen by you only (not looking for hype, and I’m almost embarrassed to share any of this). First of all, I happened to stumble on your site re: Oakland Co., and you wrote a very thorough article! Wish I had some definitive info for surviving family members, but I don’t. Just writing to let you know my oldest sister was married to John Busch (they both died in the summer of 2001). John, you may know, was one of Chris’ brothers, and he and my sister had 2 sons (who deserve to be protected). Anyway, “believing something” doesn’t make it a fact, but my sister always believed Chris was guilty; she sensed the Busch family knew, too. So sad for the victims’ families, who must still agonize for truth; I pray they are all people of faith. PS. I did have a couple email-exchanges about 10 years ago with a woman who was writing a book–was that you?? I am not writing a book. I think that Chris Bucsh was a very sick man who did some very troubling things. I cannot say specifically if he is guilty of murder. Please accept my condolences on the loss of your sister. I also wish your nephews well. We cannot choose our family and I have no desire to cause trouble for innocent relatives. If you would like to email me, host at already gone podcast dot com. I appreciate you reaching out. It all started in the early 70’s when a man walked into Schraffts’s restaurant in the somerset set mall. He sat down at the bar, talking to the bartender who gave him a room to rent. Me and another girl were almost kidnapped by the Oakland County Child killer, it is on police record in Lake Orion, Michigan. We gave a good description of him and his gremlin car. He grabbed the girl with me and I grabbed both of her arms and pulled as hard as I could he was trying to pull both of us, I got us away, we were on a dead end street, we were terrified a bus came up, so we flagged it down, we begged her to call the police, she did not help us and made us get off of the bus, we ran fast he could come up the road again anytime, This bus driver is the one who let this kidnapper killer get away, I hope it is on her conscience to this day, we could of gotten on the bus and waited for him to come back up the road and got the license plate, or if she called the police they maybe would have gotten there in time to catch him, we will never know but I believe we were his last attempt to kidnap, we saw him and we heard him as he tried to talk to us, he was a young man I don’t think much over 18, the sketch on Wikipedia is forsure him, I will never forget his face, so if they have a man that is not in late 50’s or early 60’s they have the wrong man. I pray everyday for him to be caught, I can’t believe as a child, me and the other girl escaped such a monster. May we all pray for him to be caught, but we know there is no punishment worthy on this earth, he may not be caught down here, but he is caught up there. I am sorry to hear that you had an abusive childhood, I did also, I really think that the parents of the 70’s were the saddest excuse for parents, and there was something wrong with all of them. 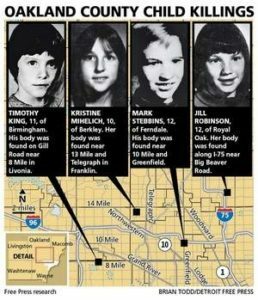 It is nice to be a survivor of a bad childhood, and also the Oakland County Child killer, I remember that guys face like it was yesterday, if you go on the Wikipedia OCCK the first face on the picture of three is the man that tried to abduct me and another girl in 1978 he was very young, very skinny, he had blonde hair and light colored eyes could of been blue or green, he was not naked with us he had on a t-shirt with blue jeans, so if you saw the face of the man that you have always wondered about, I know for sure who he is.